The simple, modern design of Balconista Furniture brings your balcony to life. 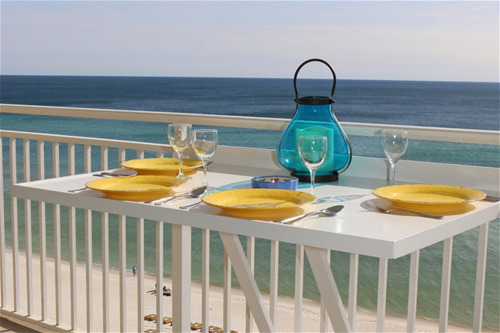 Balconista Furniture offers two distinct and functional lines -- the Balconista Line features modern 2- and 4- top table designs that maximize the view, expand seating capacity and the enjoyment of balconies, large or small. The RailRunner Line features beautiful drink rails of varying size that increase the usefulness of the smallest of balconies. Our patented products are made in the USA of weather resistant, durable materials. Easy installation makes Balconista the smart choice. Balconista Mesa is the perfect triangular 2-top table for your balcony space. This design wonder allows you to share conversation or coffee while enjoying your beautiful balcony view. The table installs on vertical rails. At 36" high it pairs perfectly with counter height stools. The Mesa utilizes an angled support bar instead of traditional table legs to provide a sturdy dining surface. Utilize your gorgeous balcony space again. Sitting is believing. The RailRunner® Largo is a 48" drink rail that provides additional surface area needed along your balcony rail. This added space will make your next get-together so much more enjoyable. You and your guests can get outside and enjoy a cold beverage and the warm sunshine. RailRunner® Largo is also perfect for commercial applications. Commercial clients and business owners installing RailRunner® Largo can increase guest satisfaction and revenues.